MAX is becoming a victim of its own success. Ridership on the light-rail system is rising as gas prices remain high, getting more cars off the road. A growing number of those passengers are bicyclists who use the trains, reducing congestion at both ends of their commute. But when bikers and nonbikers wind up on the same crowded train at rush hour, tempers sometimes flare. 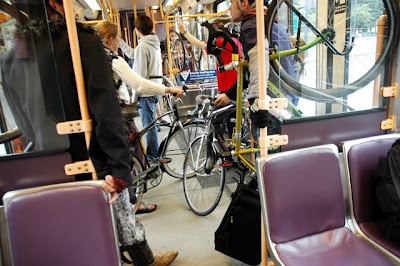 TriMet officials are looking for ways to reduce that friction, short of restricting the number of bikes on trains during rush hour. Note that one solution not suggested here is to add more cars to each train, or add more frequent trains, which would not only add capacity and reduce crowding tension, but improve service for every transit user, on bikes or not. In any event, this is a good problem to have. And Portland has done more than almost any other city in the U.S. to encourage alternatives to driving. I was pedaling from work in New London to my home in Ledyard. This was Day Two of my personal crusade to take down the rapacious global oil industry and redirect our conspicuously consumptive national energy policy. I would achieve this by not driving for an entire week. My message would surely send shivers from the Gulf refineries to the halls of Congress. I wouldn’t just not drive, I wouldn’t even set foot in any plane, train, automobile or other motor vehicle--not even a Prius hybrid en route to an organic food co-op or Earth First! rally. For those of you keeping score, I made this rash pledge during a rant about fuel prices a few months ago. I said then and feel even more strongly now: Gas is too cheap. The low price enables too many people to drive too many miles in too many cars over too many roads to too many strip malls to buy too many 48-ounce bags of Cheetos. There are many great motivations to embrace commuting by bicycle: health, fitness, ecology, economy, fun. Hostility to a rapacious oil industry ain't a bad motivation either. When Mayor Thomas M. Menino discovered the benefits of speed walking, he exhorted everyone in the city to lace up and join him. When he came down with skin cancer, Menino launched a heartfelt crusade for early screening. When he lost weight by cutting down on pasta and other carbohydrates, the mayor once known as Tank began preaching the benefits of the new Menino diet. Now, the mayor has discovered bicycling. Menino purchased a silver Trek road bike three weeks ago and has been riding it regularly through his Hyde Park neighborhood. 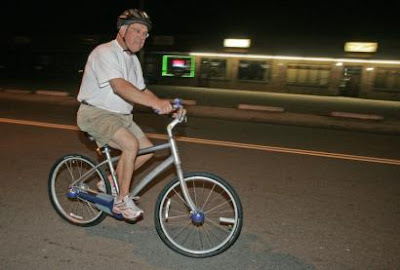 Each weekday at about 5 a.m., the 64-year-old mayor straps on a black cycling helmet and an arm band with red reflector lights and sets off alone on a leisurely, 45-minute pedal. He acknowledges that another public crusade is brewing. I'm among those who think positive change for bicyclists generally comes from the grass roots, not from politicians. However, it's always easier as an advocate if you have a supportive person in a position of power. 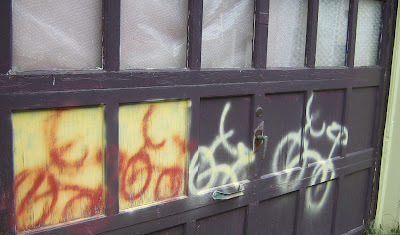 My former hometown of Boston--Go Sawx!--is a notoriously hostile environment for bicyclists. Let's hope that may change in the near future. Image: Boston Globe. Boston Mayor Thomas M. Menino. Tip of the Red Sox cap to Sasquatch Bob for the tip on this story. BUFFALO, N.Y.--University at Buffalo cyclists turned a new corner today when the university kicked off "Bicycling at UB," an initiative designed to improve bike riding to, from and across its three campuses. 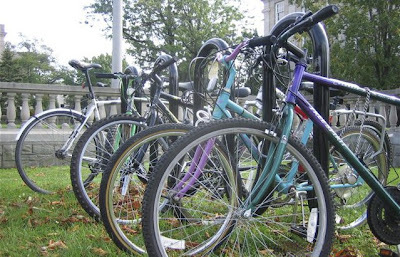 Bicycling at UB features the university's first bicycle-registration program, the installation of additional, user-friendly bike racks to securely store more than 300 bikes across the campuses and the addition of bike racks to all UB Stampede buses. It also marks the start of the university's first on-campus bicycle borrowing program as part of a partnership with Buffalo Blue Bicycles (BBB), the city-wide bicycle-lending program. This is an encouraging press release from a major university, something I wouldn't mind seeing my employer--the University of California, Davis--emulate. Yes, the university in bicycling capitol Davis makes only token efforts to actively encourage bicycle use. At present. 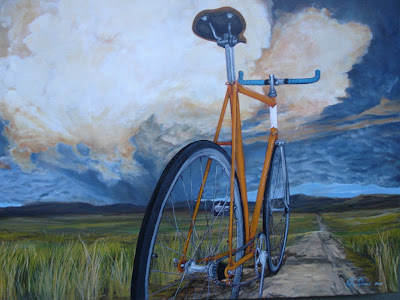 The bicycle--the most energy-efficient form of travel ever devised--deserves a bit of respect. Pound for pound, a person on a bicycle expends less energy than any creature or machine covering the same distance. (A person walking expends about three times as much energy per pound; a salmon swimming expends about twice as much.) 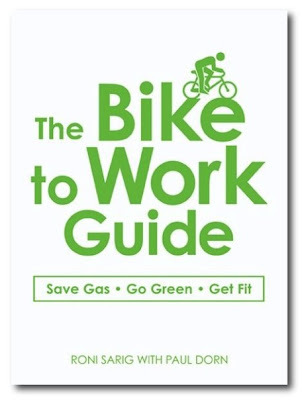 As Bill Strickland calculates in The Quotable Cyclist, "the bicycle is the most efficient machine ever created: Converting calories into gas, a bicycle gets the equivalent of three thousand miles per gallon." Replacing car trips with bike trips has unmistakable environmental benefits: reducing greenhouse gas emissions, impact from noise and pollution, and resource consumption. Commuting by bike produces absolutely no pollution! We burn millions of barrels of oil daily driving our cars, and have poor health and pollution to show for it. A compelling, persuasive, and irrefutable argument for the sanity of bicycling. Includes my favorite quotations from John F. Kennedy and H.G. Wells. Don't even bother asking Micah Deffries if he wants a ride. He doesn't, and he's doing just fine without a car, thank you very much. "I just smile and say, ‘No thanks,'" Deffries says. "I'd rather not get in a car." Deffries, 29, relies on his Ritchie mountain bike as his main form of transportation, and friends and family often can't resist offering him a ride when he's out on his bike. Before you write off Deffries as some anti-driving whack job, consider this: He says he doesn't have anything against people who drive. He just realized his driving habits weren't doing him much good. He began to see the irony in driving to the gym to get in a workout. And he thought he'd save some money by ditching his car. "Driving a car and commuting in a car is a major component to a sedentary lifestyle," he says. This article profiles a participant in bike-friendly New Belgium Brewing's Team Wonderbike "Car for Bike" program. 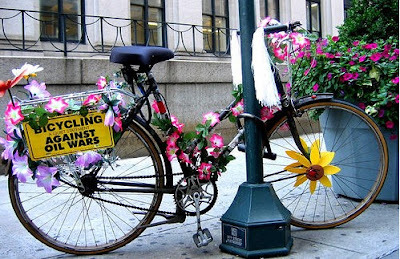 Image: San Francisco Bicycle Coalition. 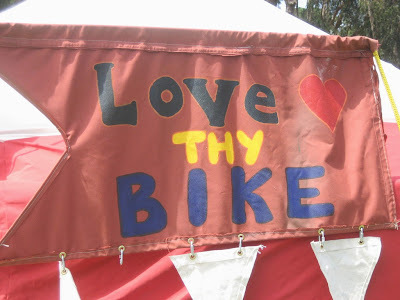 Image from Tour de Fat 2007 in San Francisco. 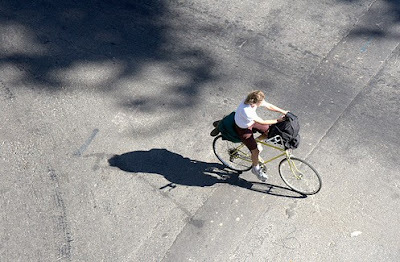 This ongoing research by Jennifer Dill of Portland State University may help provide a few answers to a long-time debate among bike advocates. Nobody disputes that more cyclists means safer cyclists--motorists become more accustomed to sharing space with bicyclists, who feel more at home on roads. The dispute is exactly how to attract more people to bicycling. Transportation funding for bicycling is sadly sparse--as it is for almost any non-automotive transportation mode. Government policy has long prioritized cars. This research may help transportation planners to more effectively use those scarce dollars to encourage more bicycle use. 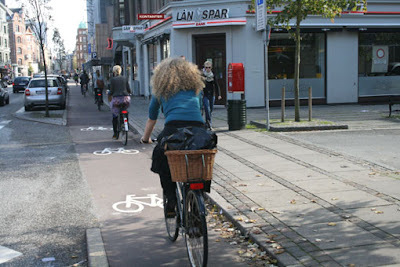 Readers of this blog know how I feel: Bike lanes make a huge difference. Because Portland-Vancouver drivers log 20 percent fewer miles a day than most U.S. urban dwellers and spend less on cars and gasoline as a result, the region's economy saves $2.6 billion a year, or about 3 percent of the area's annual economic output, according to a new study for the Chicago-based CEOs for Cities. And most of that money, which otherwise would go to far-flung car makers and oil companies, appears to go instead to housing, entertainment and food in the Portland-area economy. "It stimulates local businesses rather than rewarding Exxon or Toyota," says the five-page report titled "Portland's Green Dividend" and authored by Portland economist Joe Cortright. Bike commuting is not only fun and healthy, it is also economical. But many of us already knew that. In the video...learn how Judie Miller and Mary Anne Cassin discovered something in common last spring. Both had taken a stab before at commuting to work on bikes. Both had abandoned the effort. Both leaned on each other to start anew. Several things seem hugely enviable about these women. 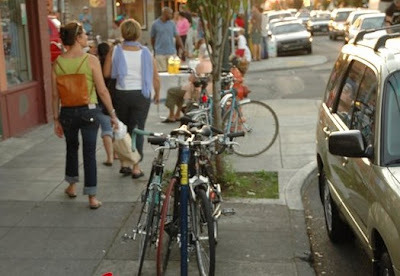 First, they live in bike-friendly Portland, Oregon. Second, they have a bike-supportive employer, which provides lockers, transit passes, storage, and encouragement. 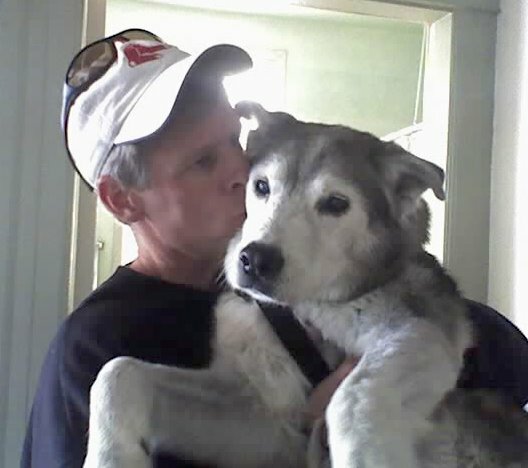 And third, they have each other as friends for mutual support. If only more people in the U.S. were so lucky. The bicycle commute home started off like any other in the 100-degree weather. It was refreshing to be riding on the outdoor trail home but then ... wham! The pain in my leg was worse than getting a tetanus shot. What the heck? Did I pull a muscle? Did I hit something? Was I hit by a flying rock? Then I realized that something was crawling farther up my hiking shorts. The path was crowded, and I couldn't just stop and jump out of my shorts. I swatted my rump. Wham! I got hit again. 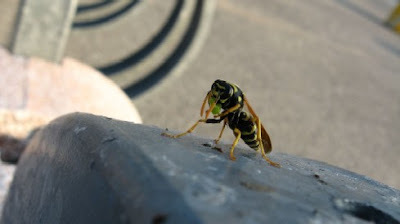 Now I knew that a yellow jacket had flown up my shorts. This article includes much useful advice on how to avoid getting stung while cycling: wear glasses to protect eyes, wear tight shorts and jersey, carry a first-aid kit with sting ointment. So far--knock wood--I've avoided getting stung. Wouldn't be fun. No belt, no bra, no pants? Todd Brugger usually forgets his belt on the day he's packed a pair of pants missing a button. But the financial analyst for Northwest Permanente who jogs or bikes to work has a quick fix. He staples his pants closed. Most folks take a more obvious approach, darting to department stores, discounters or second-hand shops for socks, underwear, bras, shirts or pants. 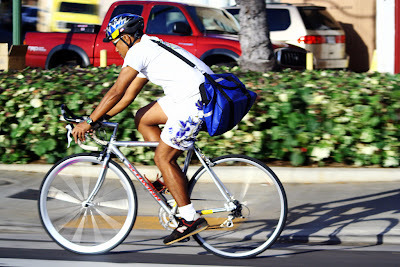 Forgetting is a natural part of bike or foot commuting, enthusiasts say. So it stands to reason that Portland--the nation's most bike-commuter-populated city--has its fair share of shoot-I-forgot-it shoppers. Scott Bricker, the Bicycle Transportation Alliance's executive director, stashes back-up suits in his office, yet occasionally overlooks socks. He doesn't sweat buying a new pair. This forgotten garment dilemma is one reason why yours truly--a middle-aged and forgetful bicycle commuter--rides train/bike to work fully dressed for work, and changes into shorts for 17-mile ride home at end of day. 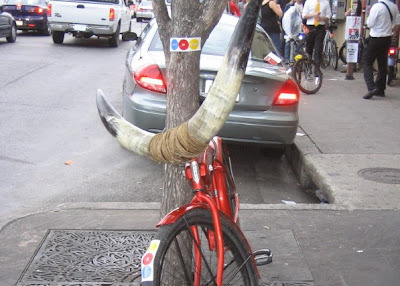 Bicycling is a key part of Austin's weird ethos. In other Texas cities, people are usually on two wheels only when turning corners quickly in their cars, but Austin is crawling with cyclists, from tight pants-wearing hipsters on fixed-gear bikes to UT students buzzing by pedestrians on campus to intense road bikers seeking the proverbial yellow jersey. This May, the League of American Bicyclists named Austin a Silver Level Bicycle Friendly Community, and Austin's many bike lanes helped the city to earn this award. A nice op-ed by a student at the University of Texas in Austin. As Southern California continues to expand and freeway overpasses arch toward the heavens, the air quality will continue to worsen. "We live in the region with the worst air quality in the nation and 80 percent of it is from mobile sources emissions," said Jonathan Baty, a member of the Bicycle Commuter Coalition of the Inland Empire. Baty's suggestion? Ride for clean air. Baty has been a life member of the coalition since 1991. 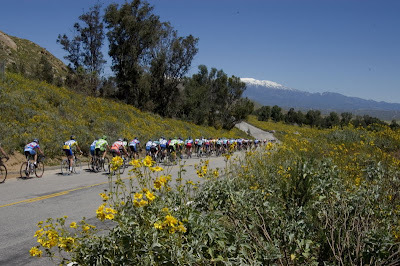 The organization has been instrumental in getting bike racks on buses, placing bike racks and lockers around town, providing input to the county's non-motorized transportation plan, and providing valet services for the Redlands Bicycle Classic for almost a decade. "We have a growing membership base and a board that is familiar with bicycle commuting," Baty said. Aside from protecting the atmosphere, Baty offers a list of reasons to bike instead of drive. I really love this "speed of sight" phrase. Beautiful. And so true. Life without the windshield is much better. This favorable article also mentions the ongoing rails-to-trails conversion in Redlands, which will provide a useful commuting corridor for many local cyclists. Image: Web capture. Non-commuting cyclists at the Redlands Bicycle Classic. Is it possible that sprawling, car-oriented Sacramento is becoming a bicycling town? A larger version of Davis? Health writer and dedicated Sacramento cyclist Peter Jacobsen thinks so. To make his case, he points to a key "indicator species," the female cyclist. Their numbers on the road, he argues, are a direct measure of the perceived safety of cycling and its likelihood to catch on with the general population. In addition to great streets in the older core area (Downtown, Midtown, East Sac), Sacramento has arguably the country's premier cycling facility, the scenic 30-odd mile Class I American River Bike Trail. 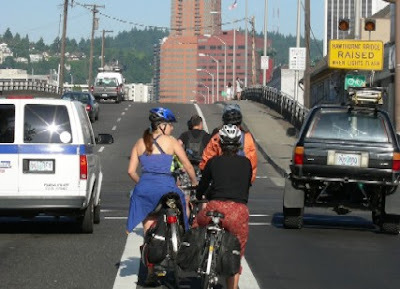 The other day, I heard a dangerously wrong statement about the state's bicycle riders. The argument was that bicycles don't belong in traffic, shouldn't be on roads unless there's a bikeway, and shouldn't ever be on sidewalks. Wrong, wrong, and wrong again. It's not surprising, given comments like that, that some folks might misunderstand the laws with regard to bikes. Bicycles can legally be in traffic with cars (so can horses and even donkey-drawn carriages, by the way). Bikes are restricted when there is a bikeway--they need to stay in it if they can. And bicycles can sometimes legally be on sidewalks. This column by the Advertiser's environmental correspondent is a helpful reminder to motorists to share the road. Planners will discuss the findings of an independent study of (the Pittsburgh neighborhood of) Oakland, conducted by Cornell University researchers. The study concluded that Pittsburgh is ideal for a large bicycling population, in part because of its many colleges, but the city needs a comprehensive bike network to make cycling safe and convenient. Joanna Doven, spokeswoman for Mayor Luke Ravenstahl, said the city will hire a full-time bike and pedestrian coordinator early next year. That person would secure money, conduct studies and improve safety and infrastructure for pedestrians and cyclists in the city. Scott Bricker, executive director of Bike Pittsburgh--a nonprofit working to make the city safer for cyclists--said recently painted shared traffic and bike lane markings have helped make conditions safer along Liberty Avenue through Bloomfield and Lawrenceville. He rides through Oakland from his home in Friendship to Bike Pittsburgh's offices in the South Side. He doesn't know how many cyclists travel in or through Oakland, but said the number appears to be increasing. Progress appears to be slow going in Pittsburgh, with no dedicated bicycling staff on the city payroll and no funding at present. That will change. Image: Web capture. Bike graffiti in Pittsburgh. "I bike everywhere just about," says Shandon neighborhood resident Natalie Britt, co-chair of the (City Council-appointed bicycling) committee. "We view the bicycle as a way to improve public health." Cycling also betters quality of life, the environment, property values and tourism levels, Britt says. An encouraging story from South Carolina's state capital and largest city--which apparently has a modest Critical Mass--featuring several interviews with local cyclists and some detail about efforts to improve bicycling conditions. Image: Web capture. 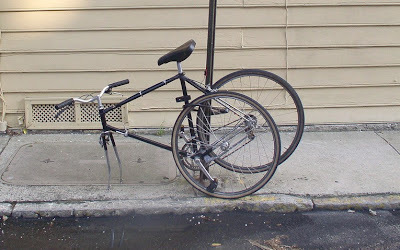 Locked bike in Charleston, SC.